The goal of this measure is to help railway staff by preparing them to cope with a possible incident in the future. This measure cannot contribute to the early trespass prevention. It is closely linked to mitigation trainings and coping mechanisms for the railway staff. There are maybe completely different viewpoints about this measure in different countries. For example, in France training does not appear to be a necessity, as some railway experts claim that the staff is already well trained and trespassing problems occur mostly because of the uneducated public. On the other hand the experts from Spain indirectly support the training of the maintenance personnel in order to develop their skills in detecting and warning trespassers. Similarly, in Turkey there is the need of more specific trainings such as anger management trainings, emergency situations management trainings or communication trainings. Organisation may have a strategy to support staff that may be exposed to traumatic events such as suicide. Support starts before an incident occurs and finishes long after – the key is having processes in place that help to mitigate the impact that suicide can have on staff. Identify the roles and activities that might put staff at risk of exposure to a traumatic event (station staff, train driver, maintenance staff and manager...). Needs of the staff: be aware of the psychological and behavioural consequences of a traumatic event. Response strategies adapted and means of action available to them. Needs of the managers: plan a recovery system for staff and managers. 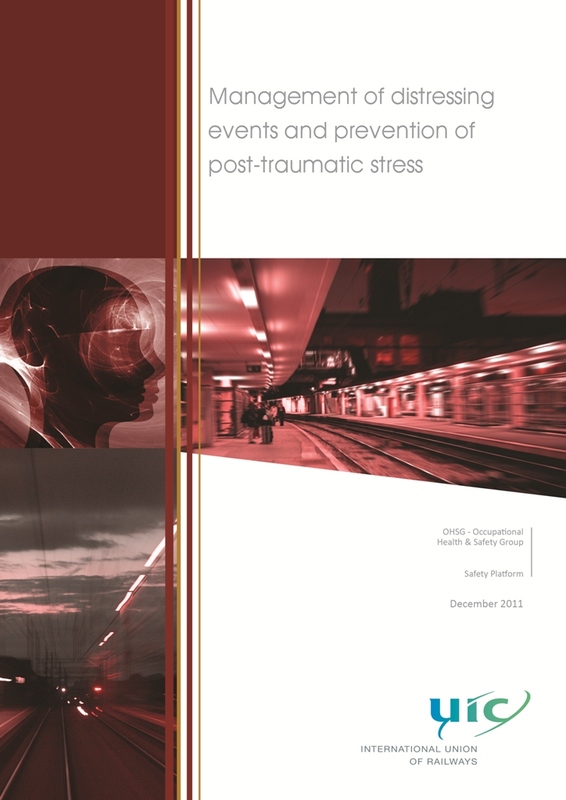 Management prior to a traumatic event should include training, information and staff follow-up in areas particularly vulnerable to risks as well as implementation of risk assessment and mitigation measures. Management after a traumatic event includes ensuring that services continues, and should take into account human values and help to person involved. As a minimum, this should include the development a clear policy for managing and supporting staff following a traumatic event. A policy also helps to build awareness of the issue across the organization. To support this policy, management procedures should be developed that describe the process for dealing with staff. What is the process to be taken when a traumatic event occurs? How will staff be supported? By whom? What support is available during and immediately after the event? How does staff access this? What follow-up will be provided? By whom? What are the steps for reintegrating a staff back into work? These processes should be briefed across the organization to ensure that all affected staff are aware of what they can expected during such events. A support system should be created for staff. E.g. : peer support, managers, occupational health teams including in-house psychological and medical support, staff assistance programmes. Staff may be better prepared for an event if they have an expectation about what might happen, and what their reaction to that event might be. Many organizations are now providing trauma preparedness training for roles where staff is likely to be exposed to potentially traumatic events. Raise awareness among those involved within the company: managers, operational staff, social partners, and human resource managers through information sessions. Training for those carryings out interventions: field staff and specialized services. Training should be dispensed by psychologists or doctors. Those who have this training will then become reference contacts within the organizational structure, taking care of the staff involved and offering them initial psychological and logistical support in the hours following the event. providing an opportunity to talk about what has just happened. What can I expect to feel or experience as a result of this event? What should I do to manage my reaction? It is recommended to remove individuals temporarily from their duties immediately following a traumatic event; consideration should be given to reviewing their work activity to assess the risk of continued exposure upon their return to work. It may be necessary to change a person’s duties for a short period to allow recovery before recommencing their normal work role. It is essential to encourage the individual to return to work by discussing the pace and nature of their return. The two following stages are follow-up and monitoring but will not be detailed in this toolbox. Examples: training on communication with third parties, specifically with persons that occasionally threaten, menace or injure the railway staff. There is aftercare directly at the scene by the on-call officer. He/she makes sure the employee will arrive home safely. The team manager has to contact the employee the day after the incident and keeps in touch with the employee regularly, also to see if he/she can return to work. After a week he offers to execute a self scan (online at the Institute for Psycho trauma NS works with). If the employee does not want to do this, this is registered by both. The self-scan is designed to show how the employee is doing and will give a green, orange or red score. The self-scan is assessed by a company with expert knowledge on these types of incidents. The Institute for Psycho trauma checks if the incident is being processed or not and will recognise a possible Post Traumatic Stress Syndrome (PTSS ) at an early stage and can offer treatment if such is the case. The self scan is not mandatory, but it is highly recommended. In most cases the employee does not call in sick. Possible treatment by the Institute for Psycho trauma can start if necessary. The company doctor does not play a role in this process. Sometimes the employee does call in sick as a consequence of the incident. If he goes to the company doctor, he will report the process with the Institute for Psycho trauma. The company doctor assesses if additional treatment or actions are necessary. Besides the formal line of aftercare, there is a company care team (“BOT-team: bedrijfsopvangteam): a team of volunteer colleague professionals, spread across the company. They receive regular training and are available for supportive talks. They can be called or e-mailed, and they can be recognised by a pin on their lapel.